Tablescapes have never been something that I could perfect. 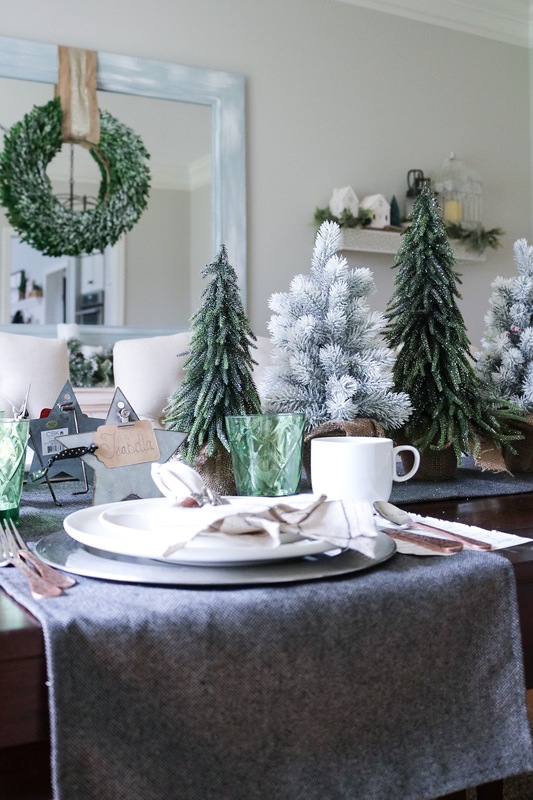 I’ve struggled with the design of our dining space for a while but really wanted to get out of that funk this year. Our home has come such a long way since we purchased it and I thought it was time to love our dining space. 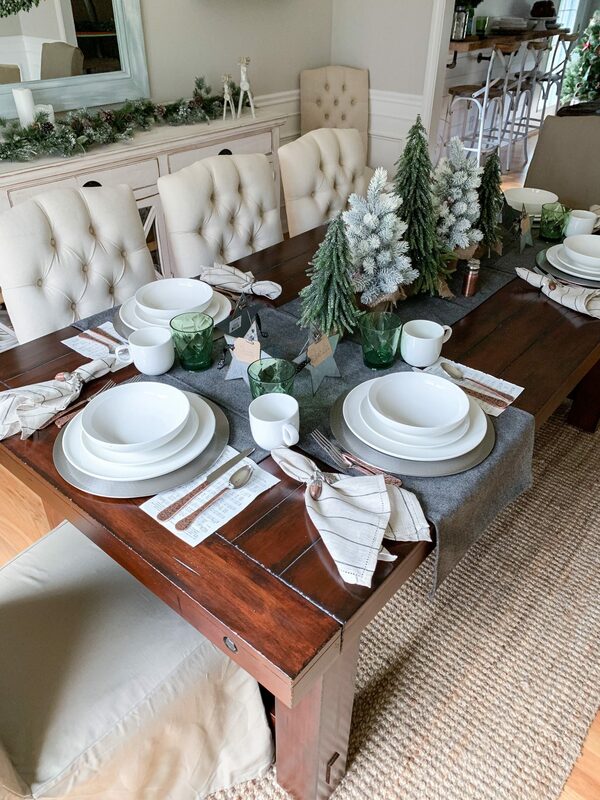 Thats why I’ve partnered with Overstock.com this year to bring you a rustic winter tablescape that can easily transition from Christmas to Winter. 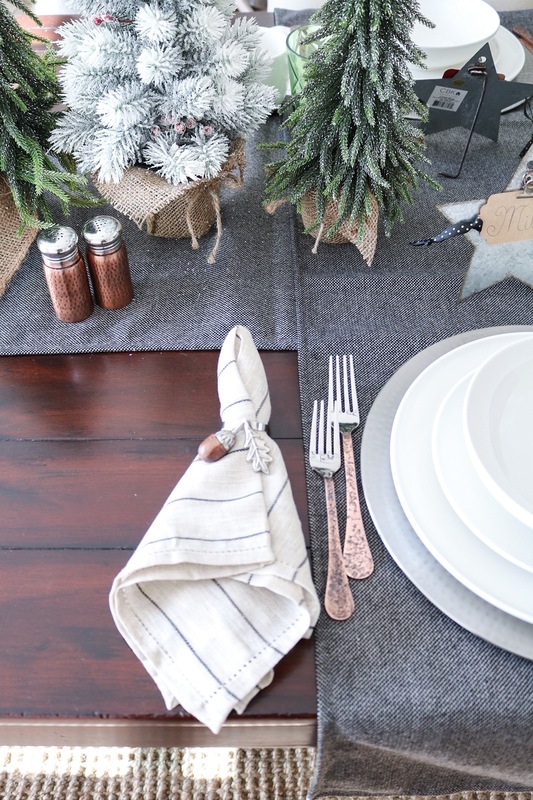 This year is all about rich neutral tones with accents of green, galvanized, and copper. In an attempt to sway from the traditional reds and greens of Christmas I chose something with a more rustic feel. Adding the mixed metals helped to create that rustic theme I was aiming for. And green, well its quickly becoming a favorite way to add color into my decor with out being overdone. 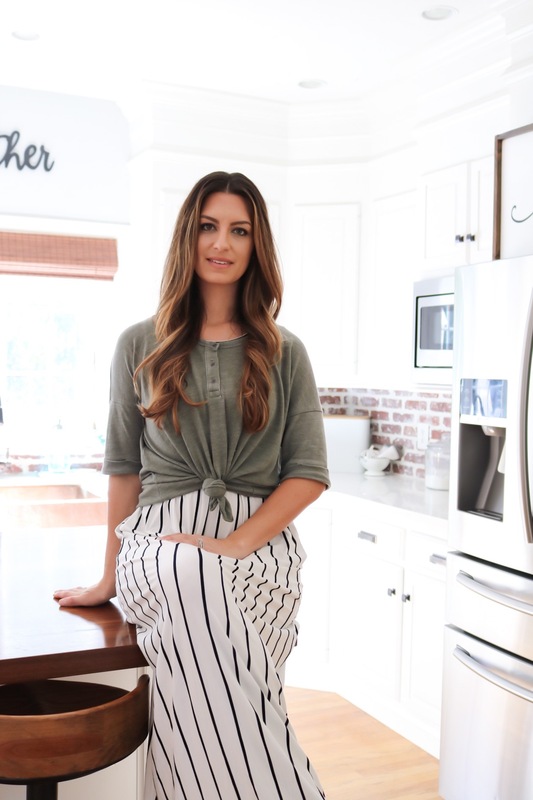 Since table settings are a new enjoyment of mine, I thought I’d share some tips on creating the space you desire with ease. Deciding on your color scheme is most important. 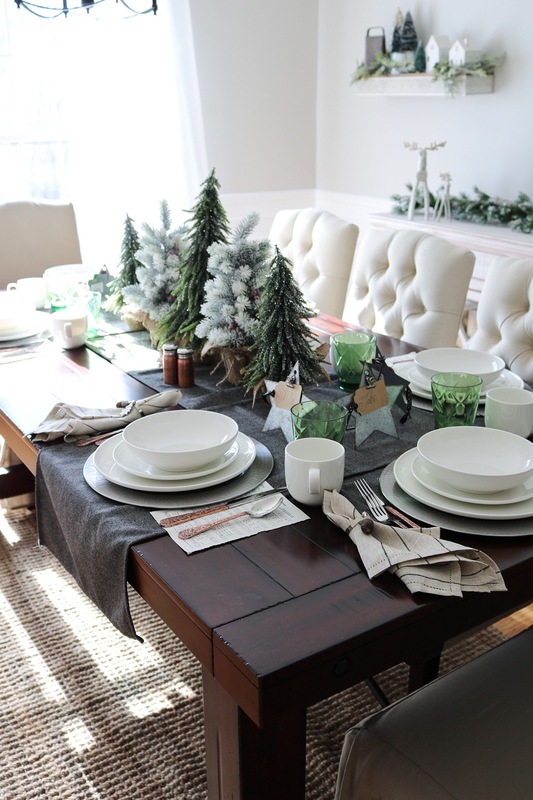 This will likely depend on your style and what occasion or time of year you are decorating for. I tend to lean towards mainly neutrals, which makes it super easy to add in pops of color that go along with your theme. 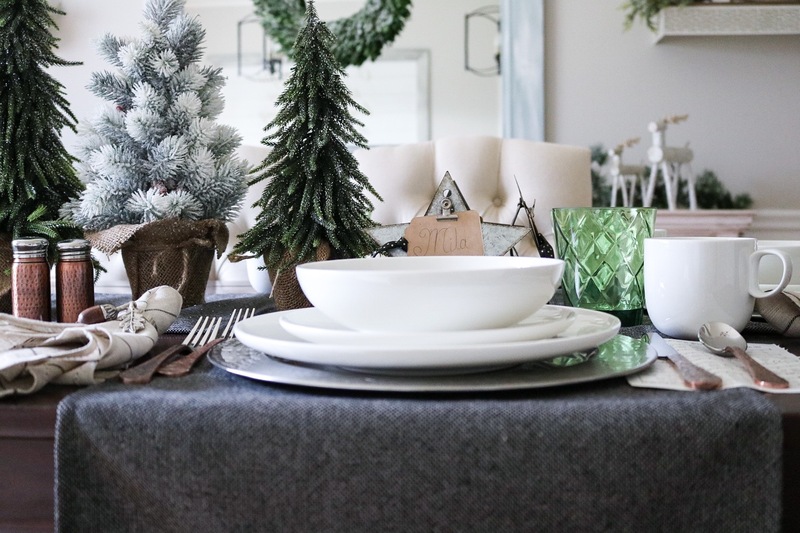 Once I had my theme and color scheme in mind I took to searching Overstock.com for all the tablescape essentials and accents that would add personality and character. 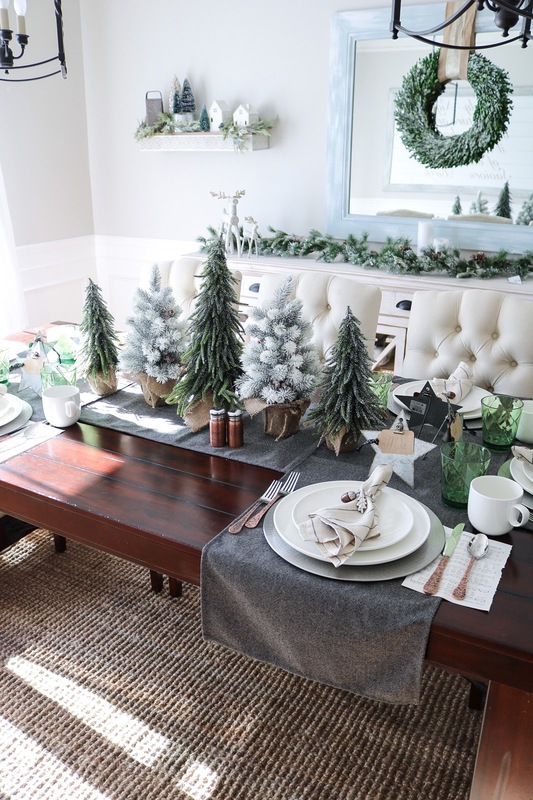 They did not disappoint, every item used to create this woodsy winter wonderland was found on Overstock! Can you believe that?! And its a bonus that they have amazing prices! Give me all the texture! And the layers! Texture makes everything feel more cozy and like home. Its like a winter wardrobe, the more texture and layers the warmer it is. I do love simple clean lines but sometimes that can make a space feel to sterile. A great way to add a lived in feel is to create interest by adding layers and texture. Thats what I’ve done here with these table linens. I don’t prefer the look of a full tablecloth so I opted to layer (there’s that word again) these black tweed runners and added the parchment napkins for a bit of contrast. You’ll notice, often times, I like to stray from the majority. I could have easily done a ticking stripe, farmhouse style runner here but the rich black tweed takes it up a notch from the norm. My favorite accents here are the antique copper flatware and hammered copper salt and pepper shakers. If you follow on Instagram, you know my love for copper. 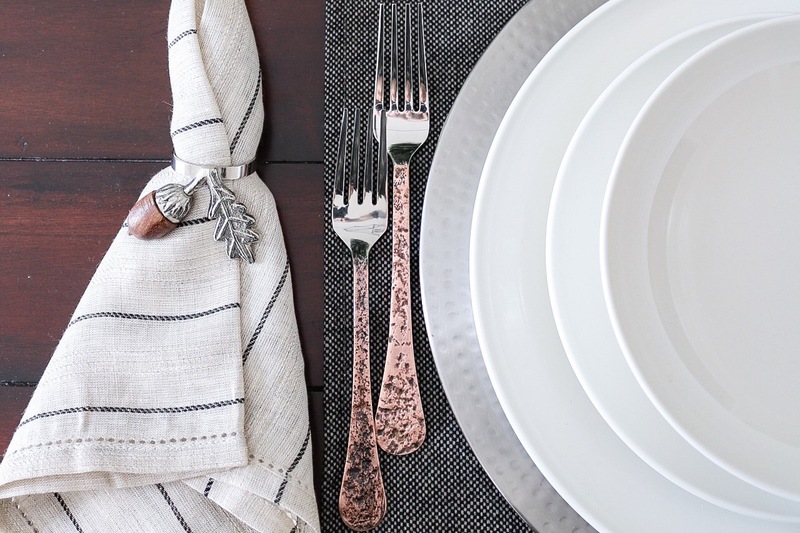 I nearly jumped out of my seat with excitement when I found this copper silverware set on Overstock! Finding this adorable copper salt and pepper shaker set was an added bonus! Copper takes the show anytime and is such a simple way to add warmth and character to your decor. Just look at how gorgeous the hammered detail is. 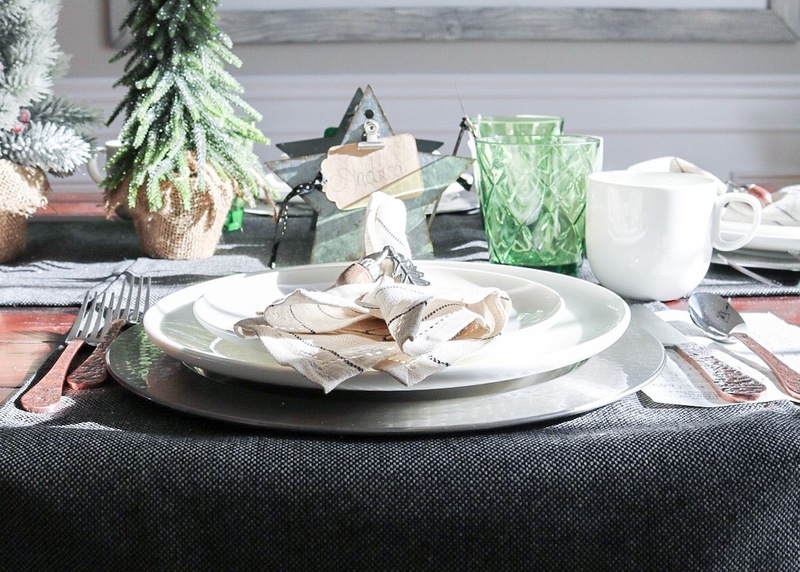 Keeping with the metal accents, I added these darling, rustic, acorn napkin holders. My favorite is that they are not Christmas specific so they will transition well to winter and can be used for multiple seasons. And combine nickel and a hammered texture for perfection! There hammered nickel chargers where another item I was super excited to find. 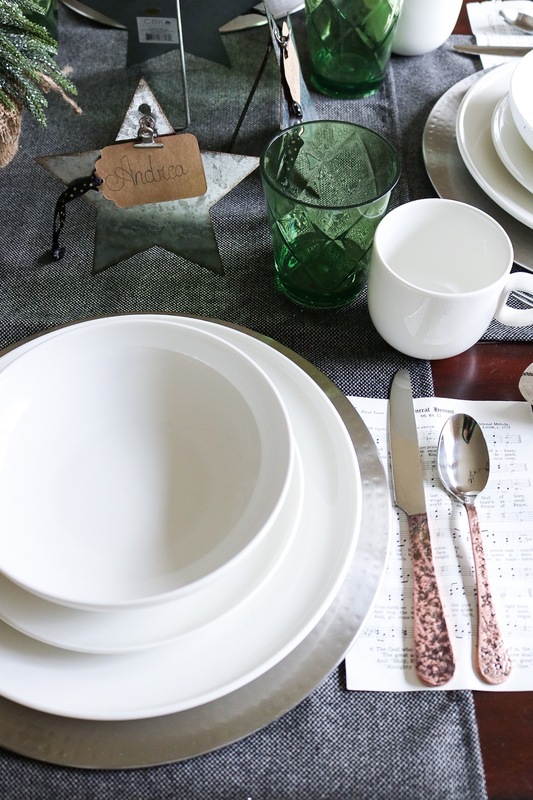 The best part is that they were large enough for the dinnerware I chose for this setting. Often times chargers are only 13″, which can end up being too small for any dishes. There were perfect at 16″ and come in a set of six! I love anything thats sold in sets, makes shopping so much easier. Items that can be used for multiple occasions are big in my book. 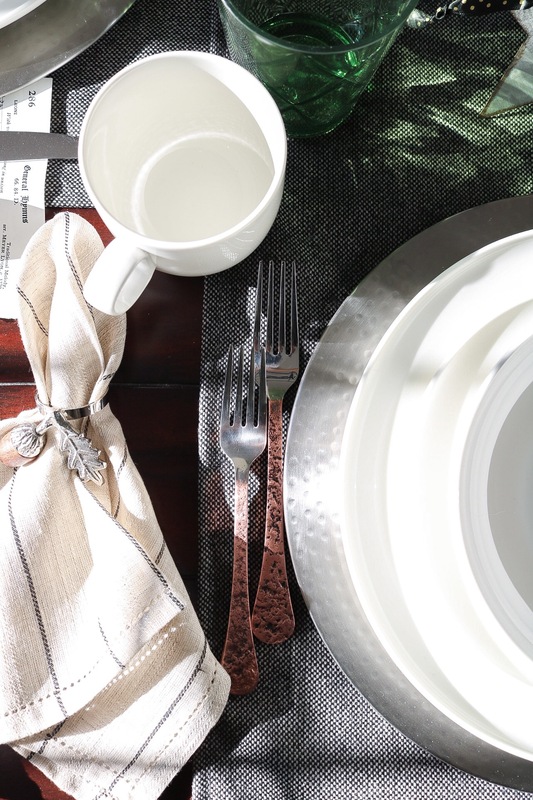 So white white my go to for dinnerware. As lovely as Christmas china is, I know its not practical so going with the safe option of a white dinnerware set was a must. To add some contrast and a nice festive pop of color, these diamond green glasses were the perfect choice. The old fashioned style is what sold me on these gorgeous glasses. I’ll definitely be using this beyond Christmas. By now you’ve noticed my darling mini trees! Trees are my obsession this season. The fact that they can play the part of Winter or Christmas decor is fantastic. 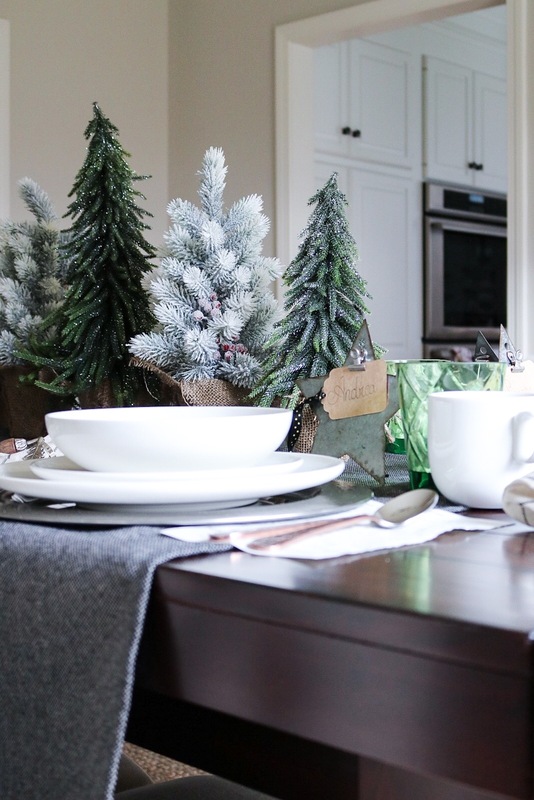 Any decor that can be repurposed for multiple seasons is worth investing in. 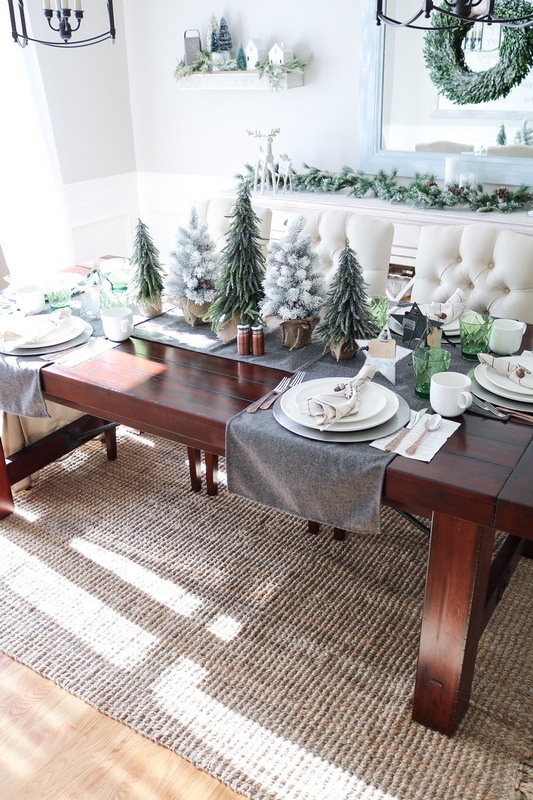 Decor can get pricey so pieces that can be used for more than one season are great to have. The weeping pine trees are my favorite! They have right amount of sparkle to dress the table up a bit. Bonus that they are available in 19″ and 14″ because using objects of varying heights is a simple way to add interest. 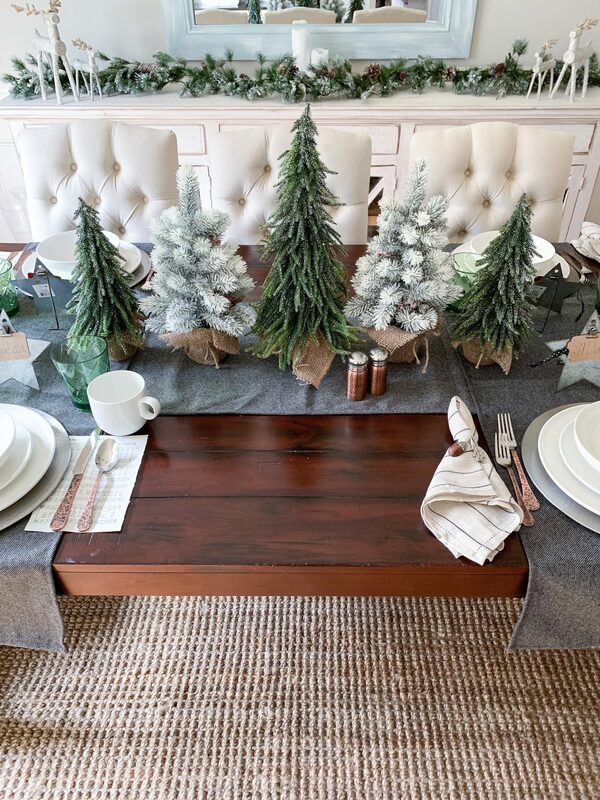 Flocked Christmas trees are the new obsession, do you love them?! 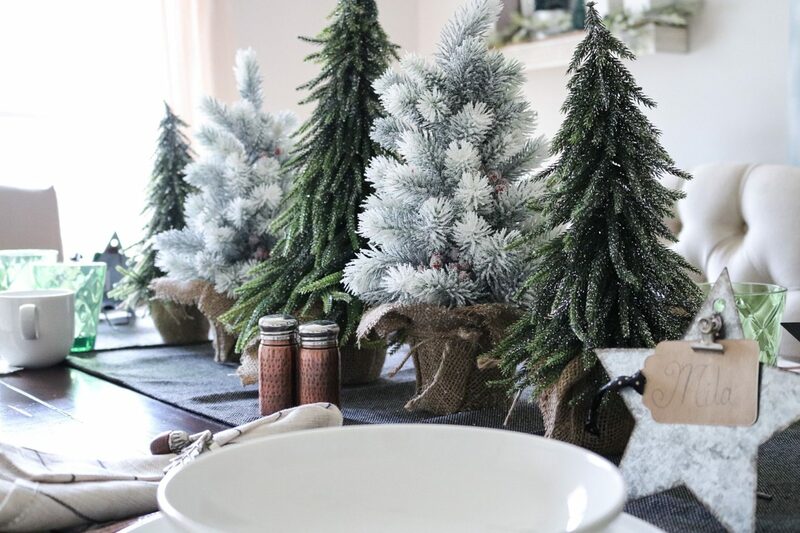 These mini flocked trees are extra adorable with their red berries. Making this tablescape extra special with the added place cards was really fun. 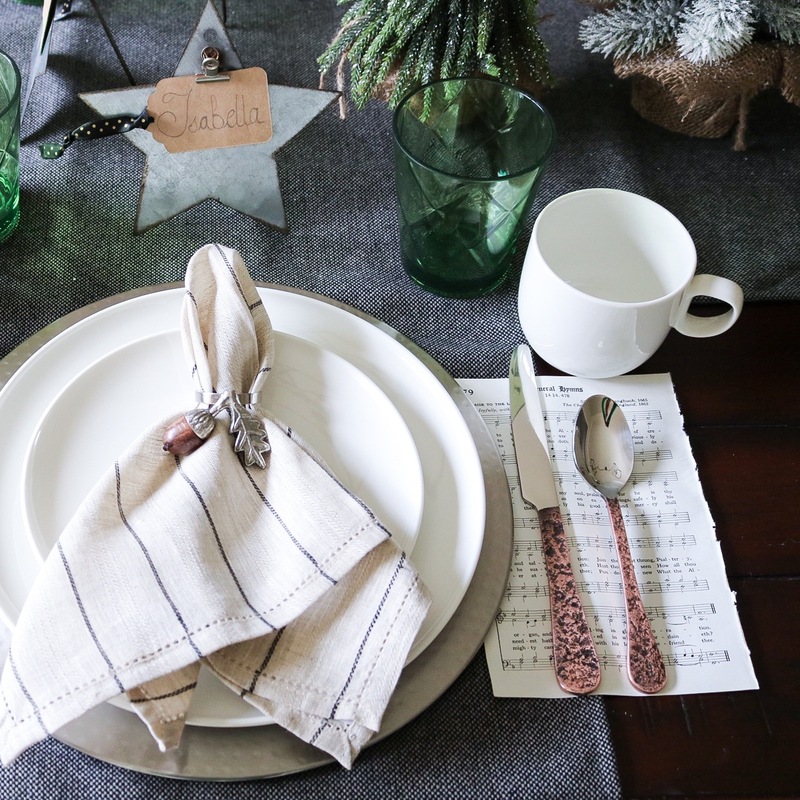 I just adore the galvanized star place card holders and love that they can be used for photos after the Holidays. You could even add fun family photos to them instead of the name cards. 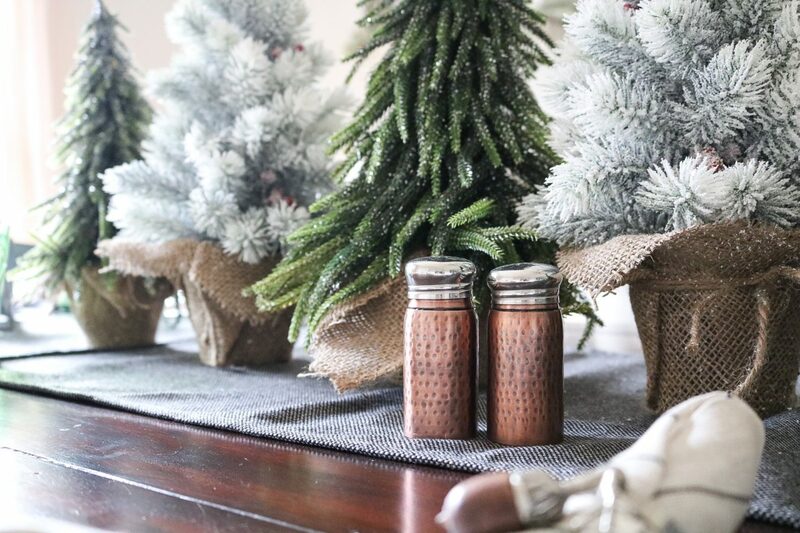 To continue the rustic theme throughout our dining space, I add a bit of holiday cheer to our buffet. 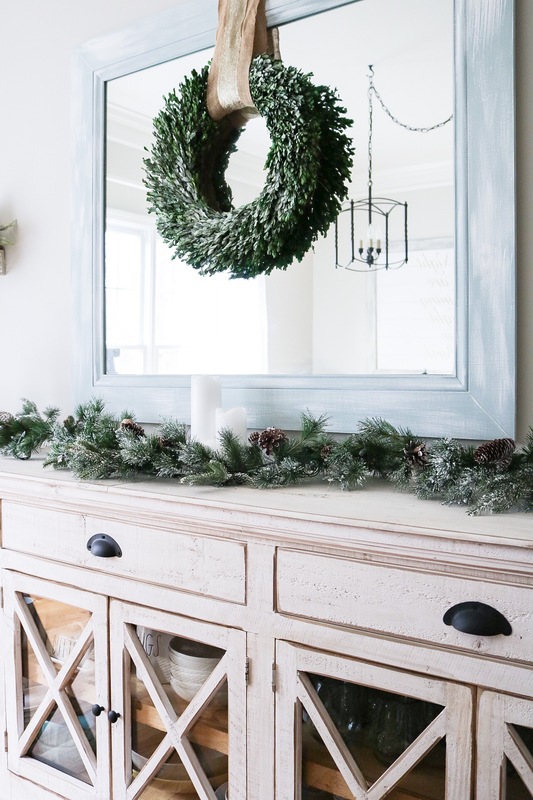 Overstock has a great selection of faux garland but I really loved how realistic the Liberty Pine Garland looks. The fact that it comes prelit is an extra bonus. Adding a trio of white pillar candles adds interest and creates a cozy rustic feel. And you know I love that these candles can be used all year round!